Schools buildings have particular design requirements in terms of spatial planning and flexible use of space, control of vibrations and acoustics, and robustness. Class room sizes are specified in Department for Education Building Bulletins, along with requirements for other larger spaces such as specialist rooms and sports facilities. In the higher educational sector, the form of construction is typically academic buildings consisting of offices, lecture theatres, classrooms and laboratories, and multi-storey student residences consisting of multiple bedrooms. Key requirements for educational buildings are fast construction programmes so that new buildings can be completed within one academic year, or even three months of the summer vacation in the case of building extensions, and also the flexible use of space to meet current and future educational needs. Steel construction has achieved a strong market share in all types of educational buildings for the above reasons. Modular construction has become the dominant form of construction for larger student residences, particularly for metropolitan universities. Shallow floor solutions have found a niche in this sector because of their superior vibration and acoustic performance, and the ability to reconfigure the internal space by re-locating internal light steel walls. 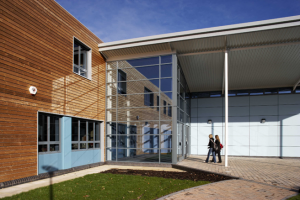 Modern educational buildings are required to achieve strict performance targets, such as acoustic, thermal or ventilation requirements and also must provide flexible spaces to suit a variety of uses. There is also a need to consider how the buildings can be adapted and reconfigured to meet future educational needs. Emphasis is placed on pupil and staff satisfaction, the studying environment as well as community involvement. Therefore robust, safe and good environmental performance are also important requirements. Often the construction of new academic, residential and sports buildings is carried out in close proximity to other functioning buildings and therefore minimising noise, deliveries, vibration and other sources of disturbance is important to the choice of structural system. The time available for construction of new buildings is often very short, typically just 14 months for university buildings and 12 months for school buildings, and the cycle is geared towards building completion ready for the start of the academic year allowing time for handover and final fit out. This means that speed of construction, often including a high proportion of off-site manufacture, is a key requirement for education buildings. 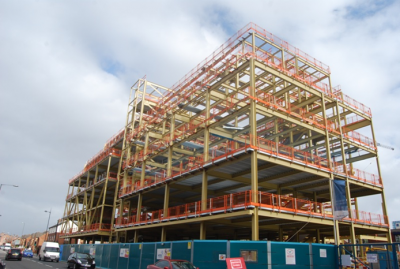 Speed and off-site manufacture are important attributes of steel construction. Steel construction is able to address all these aspects and is routinely used to deliver cost effective and sustainable educational buildings. Off-site manufacturing improves safety and construction speed, reduces waste and disturbance, and results in better quality. Modular construction is widely used for the construction of student residences because of its speed of construction, and also because of the economies of scale that can be achieved by manufacture of multiple similar bedroom units. The use of prefabricated components means that construction periods can conform to the academic year (July of one year to August of the next). Long span steel construction creates column-free space and allows rooms to be configured on the floor plan to meet the current and future educational needs. Light steel internal walls can be relocated, leading to fully adaptable buildings to meet future needs. Health and safety is improved due to increased control over off-site operations, which is important if construction is in parallel with educational activities. 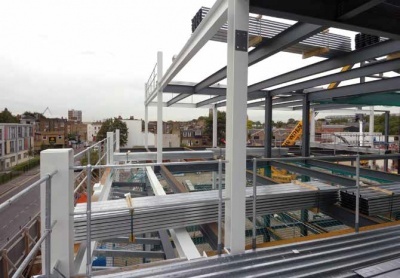 Steel or composite frames are lighter than concrete frames, thus foundation sizes, which may be important in minimising on site activities, are generally smaller. The aesthetics of school and University buildings is important in achieving a creative working atmosphere. Slender members can be designed efficiently, with the use of tubular sections. Ease of forming curved and perforated members adds to the lightness of the structure. Painted steel surfaces can be kept clean, and steel decking is free from dust and contamination. Intumescent coatings for fire protection can be sprayed and dried off-site and do not produce dust or dirt. 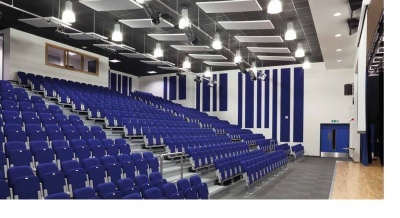 Steel construction can be designed to achieve levels of acoustic insulation required for teaching, including music rooms with special requirements. 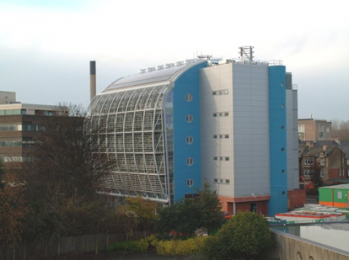 Light steel infill walls provide a high degree of thermal insulation. Insulation material is placed outside the steel frames to create a ‘warm frame’. Light steel walls may be re-located in the future. A variety of cladding materials may be used to provide a strong visual effect. Steel construction is produced efficiently, waste is minimised, and steel can be reused and recycled multiple times. It does not deteriorate over time. Steel is also non-combustible and does not cause cracking due to long term creep and shrinkage. Building types required for the educational sector are dependent on the different needs of education in early and later years in progression from nursery, primary, first and middle schools, secondary and sixth form or colleges and finally universities. These building types can vary significantly in terms of form, function, scale, layout, and location. Nursery and primary schools are usually single storey buildings of simple construction, where easy access and space flexibility are key. Secondary schools are larger, and cater for a greater number of pupils than primary schools, and therefore are often 2 or 3 storeys. Their layouts are mainly dictated by subject departments with have different space, size and environmental requirements. The Building Schools for the Future initiative led to designs by leading architects that involved interesting mixed use of materials and creation of high quality internal and external space, as shown. 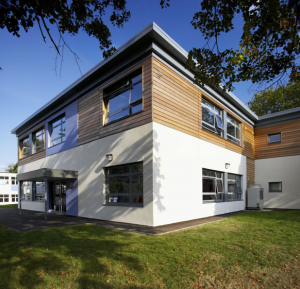 This has continued with the Priority School Building Programme (PSBP), although there has been a drive to make significant cost reductions by standardising design solutions at all levels of the school building sector. University buildings are often much larger than school buildings, and for metropolitan universities in particular, are often 4 to 8 storeys high. They are built with the same construction methods as multi-storey office buildings. The main difference is that the space provision can be more complex with, for example, the need for large lecture theatres or laboratories with vehicle access at ground floor. The high design loads and strict control of vibrations that are required for these spaces means that the steel elements are often heavier than in office construction. University residential accommodation is also an important sector and generally consists of 6 to 12 storey blocks often with communal space at ground floor level. The design of student residences is such that bedrooms are arranged in a cluster of 5 or 6 together with a communal kitchen. The rooms are often arranged in a linear style and the acoustic separation and fire compartmentation functions are provided by the enclosed perimeter of the cluster of rooms, which includes the corridor wall and floor. This arrangement leads to the use of double corridors as shown so that independent access and means of escape is provided. Many student residences are constructed from similar sized modules that are manufactured off-site, so that they can be installed rapidly. Braced steel frames consisting of downstand steel beams with precast concrete units or composite slabs. Shallow floor systems for medium-sized buildings, especially those requiring flexible service routing. Steel beams with multiple service openings (cellular beams) for larger multi-storey buildings in which the provision of long spans to provide adaptability of space use is the controlling factor. Light steel framing for smaller buildings, and light steel infill and separating walls within steel framed buildings. Most steel structures are designed as braced frames in which bracing is placed around stairs or within internal walls, etc. Bracing can be in the form of X bracing using cross-flats that can be incorporated around building cores and in brickwork cavity walls. Alternatively, K or V bracing may use hollow sections, and can be efficient where used around windows, etc. 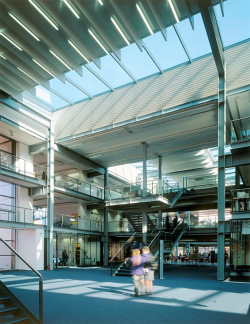 For low-rise educational buildings, it is also possible to design the moment resisting connections between the beams and the columns, so that bracing can be eliminated. This permits design of more open internal space and highly glazed external walls, which may be useful to the planning of the building. In the university sector, many innovative forms of construction are used, particularly where large atria and public spaces are part of the design concept. 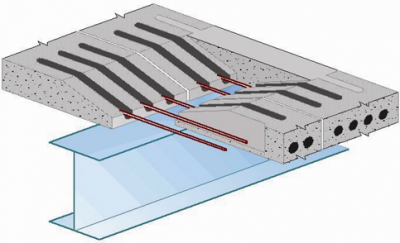 The requirements for effective ventilation and for energy saving can lead to many interesting solutions, such as the creation of a floor plenum for distribution of air and with an exposed floor soffit. An example of a university building constructed with this innovative use of steel is shown right. Hollow section columns are often used for aesthetic reasons and also to minimise the size of the column for a multi-storey building. This may be important in auditoria, etc. This is widely used for all types of multi-storey buildings, including many universities and larger school buildings. Spans of 9 to 12m are common in this sector, as it leads to efficient use of rooms for offices and classrooms, etc. For this scale of building, vertical bracing or concrete cores are required for stability. Slab spans of 2.5 to 4.5m can be achieved without requiring temporary propping and so secondary beams are required to support the floor slab. Normally I section beams are used and there is a benefit in using column sections as beams to minimise the overall floor depth. Services can be suspended from the soffit of the floor slab. Long-span beams may be used over auditoria and gymnasia; cellular steel beams with regular openings are often specified. Where the auditorium/gymnasium area is at ground floor level and the office and class room space is above, then the beams act a transfer structure to support the loads above. In this case, the beams may be fabricated from plates. Typical spans are 15 to 20m but longer spans are possible. Often these long span beams are exposed without suspended ceilings. The beams are usually (but not always) fire protected using thin film intumescent coatings. They may be connected to hollow section columns, also for visual effect. For schools which are 1 to 3 storeys high, the main form of construction comprises precast concrete units which may or may not be composite, on steel beams. These may be in the form of downstand beams that are aligned with the walls or alternatively shallow floor beams that are integrated within the floor depth. The hollow-core slabs span 5 to 9m between the beams. This is effectively a rapid and ‘dry’ form of construction which is very suitable for this sector. Tie reinforcement is placed in the filled cores for robustness, as shown. Shallow floor systems are often used in educational buildings because the lack of downstand beams means that the overall floor depth is minimised and the internal space used can be configured (and reconfigured) effectively. Modular construction is often used in educational buildings. Modules can be provided to site with pre-installed cladding, ventilation and lighting systems. By fitting out modules off-site, on-site construction programmes and disruption are minimised. Modules are typically 3 to 3.6m wide for ease of transportation and installation. Often the modules used for classrooms are up to 12m span and have open sides so that 3 or 4 modules are placed side by side to form larger rooms. Modular building systems used for schools can be up to six-storeys high but are more typically one or two storeys high. A separate framing system will be required for open-sided or open-ended modules in multi-storey applications. The extension to York High School comprised 52 steel-framed units in two different sizes, which were craned into position in just six days, reducing disruption to the daily operation of the school. 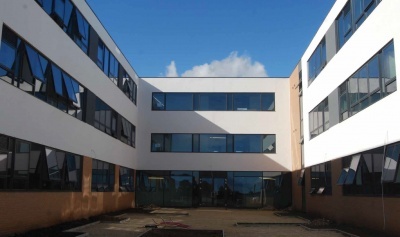 The 2000m2 two-storey scheme replaced a number of existing buildings and was completed in only 6 months; an estimated saving of up to 6 months over traditional construction. A variety of façade treatments were possible and also the large entrance area was made possible using the mixed use of steel components, as shown. The other main market for modular construction within the education sector is in student residential buildings. In this case, the modules are load–bearing and can be designed up to 12 storeys high when stability is provided by bracing or by concrete cores. The study bedrooms are typically 2.7m wide and 6m long and are constructed from light steel components. 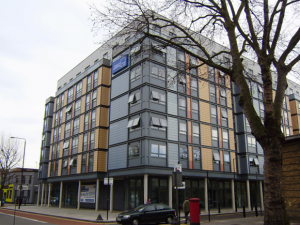 One example of a modular student residence is on Holloway Road, north London which consists of 669 modules for en-suite bedrooms, kitchens, and ‘micro-pad’ apartments. Many modules have bay windows and cantilever over the modules below. 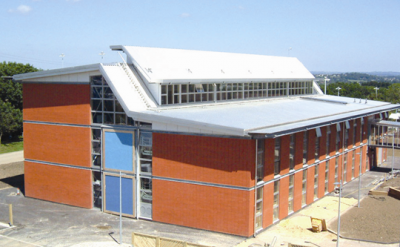 Cladding is insulated render and simulated brickwork attached to a separate light steel sub-frame. The modules were installed in just 17 weeks at a rate of 8 per day. In many modular buildings, the modules are placed on a steel framed podium level, so that the ground floor can be configured for communal spaces or offices. A good example is shown. Columns are aligned with every second or third module and steel beams support adjacent modules. Light steel construction is widely used in the educational sector as the load-bearing structure for smaller school buildings and student residences, etc. Spans are generally limited to about 6m, but the primary advantage is that the self-weight of the structure is very low, and little specialist equipment is required on site. This means that it is a useful technique for building extensions, and particularly roof top extensions where one or two floors are added to an existing building. Light steel infill walls are also widely used in schools and university buildings that are constructed with steel or concrete frames. Because the wall heights are in the range of 3 to 3.6m, 150mm deep C sections are generally used, which span vertically between the floor and edge beams of a primary steel structure. Large windows can be designed in infill walls. The same systems may be used for internal walls, and all light steel walls are re-locatable to meet future space needs. 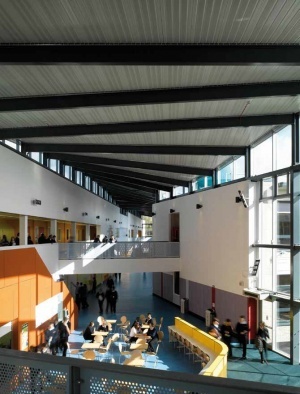 High levels of thermal and acoustic insulation and fire resistance can be achieved, making this form of construction ideally suited to the educational sector. Free schools are funded by the government but aren’t run by the local council. They include general (all ability) schools, university technical colleges which specialise in subjects like engineering, construction or maths, and studio schools which are small schools delivering mainstream qualifications through project-based learning. The Priority School Building Programme (PSBP) is focused on rebuilding and refurbishing school buildings in the worst condition. The Programme has two phases. The first phase, PSBP1, included 260 schools for rebuilding and/or refurbishment: The first school opened in April 2014 and the vast majority of others were scheduled to be open by the end of 2017, two years earlier than originally announced. The second phase, PSBP2, includes rebuilding and refurbishing individual blocks at 277 schools using capital grants. 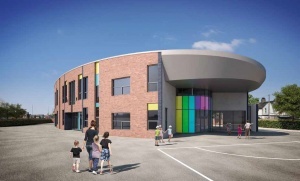 The ESFA expects all PSBP2 schools to open their new or refurbished buildings by the end of 2021. Academy school buildings can also be procured independently. University buildings are also procured by dedicated in–house estates teams who interact closely with stakeholders within the university. 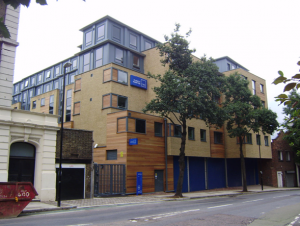 Many student residences are constructed on a design build management and operate basis so that the university does not have to make a significant capital outlay, although it has to provide the land. The current Government has focussed on making significant cost reductions by standardising design solutions at all levels of the school building sector, and has produced a set of baseline designs that demonstrate good practice that can be achieved within the set cost and area allowances. The architect together is generally appointed by the University or school and is engaged in the feasibility, planning and costing process, which are often long processes because of the need to consider the space and facilities planning with various stakeholders. The construction work also has to be planned carefully to minimise disruption to the school or University and this may require extensive rounds of discussions with prospective contractors. Accurate cost and time planning is therefore essential to the success of traditional client–contractor procurement. Design and build is commonly used where the building specification is provided in detail and the contractor responds with a fixed price. The clients architect may then be novated to the contractor to carry out the detailed design. This form of procurement leads to more cost certainty at contractor’s risk but conversely, there is potentially less scope for the client to be actively involved in the design process. In the University sector, specialist equipment and facilities may also be required which impose constraints on the procurement and planning and construction process. PFI is a version of Public Private Partnerships (PPP), which involves the competing private sector consortia submitting bids to win the commission to design, build, finance and operate support services for the school. The bidding consortia, which include architects, design teams, construction, legal, financial and facilities management experts are specially formed for each project. During the competitive stage, the consortium members develop their response to the client’s brief offering architectural, finance, legal and facilities management solutions. Unlike traditional procurement, PFI design team awarded with the contract does not have the chance to work closely with the school community, during the brief development phase. Student residences may be procured by a form of DBFO, where the provider manages the whole process and delivers the completed building on the University site to the required specification and time scale. This may also extend to daily management and operation of the facility and the DBFO operator also receives the rental income as well as retaining the asset value of the building. In this way, the University increases its student residence numbers but does not significant capital outlay. This form of procurement may also extend to sports facilities, theatres, medical facilities etc. 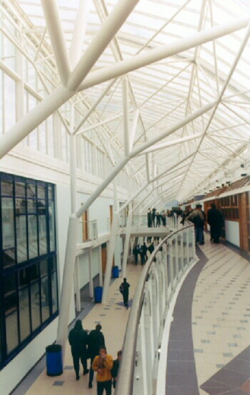 Specific guidance on the cost planning of steel framed education buildings is available that builds on the general guidance on the cost of structural steelwork, and cost planning through design stages for structural steel framed buildings by considering the typical design and construction characteristics of education buildings. It explores the importance of programme, the key cost drivers for the education sector and the principal factors to consider when using standard cost ranges to ensure that realistic cost plans are produced during the design and early stages, when a number of frame options may be under consideration. The construction programme for most forms of educational buildings is usually influenced and constrained by the academic terms and year. Usually, the contractor sets up site facilities in June or July and the whole construction cycle has to be completed by August of the following year. Where existing buildings are demolished, the move from the old buildings to temporary buildings has to be arranged at the same time as the new construction. Furthermore, the noisier and potentially more disruptive parts of the construction cycle have to be organised around weekends, half term and end of term holidays. This also means that large cranes and other specialist equipment are only used when the students are not present. Steel construction is ideally suited to the educational sector because it is fast, and less disruptive than site intensive construction. There is benefit in using off-site construction including prefabricated services and modules, and lightweight cladding that can be installed rapidly. For the full potential of the advantages of steel-frame construction to be realized all parties must be aware of the constraints imposed on the design programme by the lead time between placing a contract for the supply of the specialist components. The programme should include such critical dates on information release as are necessary to ensure that detailed design, material order and manufacture can progress smoothly. Sustainability of all types of educational buildings is important throughout all stages of the design, construction and operational of the building. Many schools and universities are keen to promote environmental awareness and learning and so sustainability is manifested in the design of highly sustainable buildings which are often very energy efficient in operation and frequently with a high proportion of renewable energy provision. 15% of the UK public sector carbon emissions is contributed by school buildings. As part of the previous 'Building Schools for the Future' programme there was a significant drive to make schools more sustainable and for new school buildings to be examples of best practice in sustainable construction. Government wanted every school to be sustainable by 2020 and a National Framework was established to guide schools towards this aim. A sustainable school was defined as one which prepares its pupils for a lifetime of sustainable living through its teaching, fabric and day-to-day practices. The current Priority School Building Programme has a greater emphasis on standardisation, cost reduction and energy efficiency. The educational sector is one in which the whole life perspective is very important as operation and maintenance costs, and any predicted future costs of re-configuring the building, also have to be considered. This also extends to the capital costs of the carbon reduction measures. Many fundamental aspects of sustainable school design, like the potential for electricity use reduction by ensuring natural lighting or minimising mechanical ventilation requirements by use of passive ventilation need to be considered at the initial design stage. However, this is an area where design decisions to improve sustainability do not adversely affect the optimum functionality and operation of schools. The findings from a comprehensive sustainability assessment of a secondary school are provided in the Target Zero Schools guide. 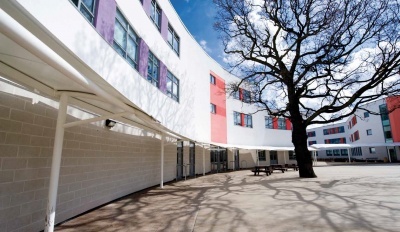 In 2005, the Department for Children, Families and Schools (DCFS) required all major new school buildings and refurbishment projects are BREEAM assessed and achieve at least a ‘Very Good’ rating. DCFS was replaced by the Department of Education (DoE) in 2010. In 2012 the Government announced plans to drop the requirement for new schools to be assessed using BREEAM. However, no definitive statement has been issued and readers are advised to check the status of this. 4.8% to achieve BREEAM ‘Outstanding’. Further information is available in the Target Zero Schools guide. Funding or local planning requirements often require that a minimum proportion of a building’s energy needs to be met using renewable energy. The Target Zero project explored many of these techniques for new school buildings and provides in-depth guidance about how to achieve low and zero operational carbon targets in schools buildings. 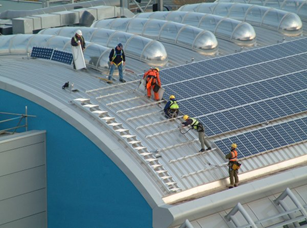 Photovoltaic panels generally located on the roof, which is south facing but east and west facing roofs are also possible. Ground sourced heating through pipes laid in the surrounding area which reduces the need for water heating and can provide cooling. Combined heat and power possibly using biomass fuel, where the heat can be used efficiently for a swimming pool, etc. Energy efficient HVAC systems are also required to meet the ventilation requirements. Solar shading is also used to reduce internal heat gains without affecting natural lighting adversely. 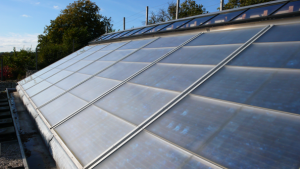 Often it is likely that solar thermal and photovoltaic technologies will be used to enable school buildings to reach on-site Carbon Compliance targets. Once particular technologies have been selected, they should be integrated into the design and procurement process at the earliest opportunity to optimise the design and reduce unnecessary capital expenditure and delays. Good working and learning environment including aspects, such as air and lighting quality, noise attenuation, and responsive services. etc. Similar requirements exist for the higher education sector but here the focus is more on the functional use of the building, the need for specialist and self-learning facilities and laboratories, and also the University’s image in terms of architectural quality and sustainability, etc. Important aspects of the design requirements are described below. Primary schools - classrooms are preferably square and of 55 to 62m2 net floor area depending on classroom type / use for a typical class of 30. The minimum ceiling height is 3m for a 7.2m depth for daylight and natural ventilation. Secondary schools – classroom sizes vary with teaching subject and class size. A general classroom is 55m2 net floor area for 30 pupils, and the classroom size increases to 62m2 for an ICT–rich classroom. Science areas or practical rooms in secondary schools are typically of 83 to 104m2 floor area . The minimum ceiling height is 3.3m for a 7.8m depth for daylight and natural ventilation. One toilet for no more than 20 pupils and 10 full time staff, plus disabled facilities according to current regulations, is required. Dining rooms and sports gymnasia generally require larger and taller spaces. The location of toilets and changing rooms should balance the needs for privacy and supervision. Changing rooms with showers should be planned near to indoor and outdoor sports activities, and the size of changing areas should cater for half a year group with separate facilities for boys and girls. The space allowance should be at least 0.9m2 per pupil plus 5m2 for disabled users. Changing facilities for staff should also be included. Showers, one for every 7 pupils, should be in individual cubicles of at least 1.25m2 plus a drying area. Dining and kitchen spaces depend on the provision planned. A typical figure of 0.9m2 is allowed for dining/socialising space for 11-16 year old pupils. This space could be used for other purposes when meals are not being served. The size of the kitchen depends on the catering system. Stair widths are determined by escape in case of fire. In schools, the minimum stair width is 1.1m but wider stairs (up to 1.8m) are often required in multi-storey schools for rapid evacuation. The preferred rise for each step should be not more than 150mm, and the tread between 250mm and 280mm. The handrail should be 0.9 to 1m above the floor or pitch line. The headroom should be minimum of 2.0m. At least 25% of the net area of a secondary school will be required for circulation space. The equivalent figure for primary schools is 22.5%. Corridors leading to more than two teaching rooms should be a minimum of 1.8m wide, and 2.55m where lockers are provided along the corridor. A minimum clear width of 1.2m is required for small corridors used by staff or by a limited number of students. The modern learning environment requires high quality levels of natural and artificial lighting, effective ventilation and thermal comfort. 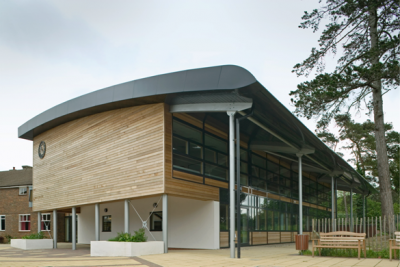 Natural ventilation is preferred for reasons of energy efficiency but for an optimum learning environment, it is necessary to maintain the supply of fresh air in all conditions. Students perform at their best when the relative humidity is between 40 and 60% and temperature is between 20 and 22°C. Fresh air supply should ideally be around 8 litres/sec per pupil but the recorded median for naturally ventilated buildings is 3 l/sec. Classroom size requirements and the need for compartmentalisation in many new schools often precludes the adoption of natural ventilation. Build-up of carbon dioxide in smaller or densely occupied rooms is known to affect learning and so effective ventilation is important which often has to be delivered mechanically as part of mixed-mode ventilation systems. According to orientation of classrooms and other rooms, solar shading may be required to prevent excessive solar gain. Cross ventilation should be provided where possible however compartmentalisation and class room sixe requirements often precludes the use of natural ventilation strategies in many schools. Attention should be paid to the acoustic environment, both sound-proofing between rooms and sound absorption within rooms to reduce unwanted reverberation. Local automatic control of heating, lighting and ventilation is preferable, with manual overrides to cater for exceptional conditions. Consideration must be given to the heights of switches, sockets, window cills, radiators, dado trunking and vertical pipes or ducts, etc. Services routes must allow future access and ease of maintenance. In many school buildings, the steel systems used and facilities for service integration are similar to those in multi-storey offices. 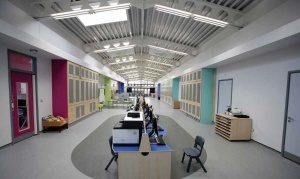 Guidance on acoustics, lighting, ventilation, thermal comfort and indoor air quality in schools is available from the Education & Skills Funding Agency (ESFA). Design and build is the norm in the educational sector which may mitigate against the use of complex services, such as mixed-mode systems with heat recovery. Maintenance is also a key issue particularly in schools who may not have dedicated maintenance staff. In all types of educational buildings, robust performance, durability and cleanliness are important design requirements. 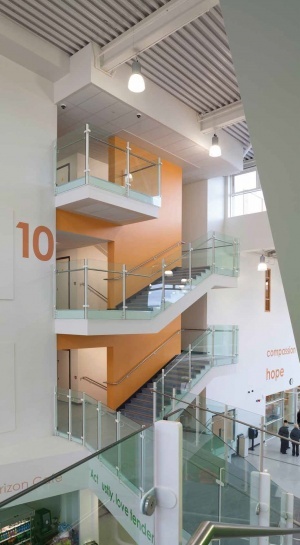 This also covers the choice of the corrosion protection system for steelwork used in schools. All types of corrosion protection system may be used, and the choice often depends on whether the steelwork is exposed internally or externally. 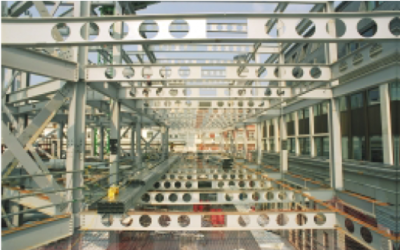 Hot-dip galvanizing may be used for concealed steelwork but for exposed steel, a high-build coating is often preferred. Good acoustic performance of school premises is vital for good sound quality. It is important that students can hear clearly and that the level of unwanted external noise is minimised. Music rooms, recording studios, open-plan areas and rooms where pupils with hearing impairment are taught may require higher acoustic standards than those for normal teaching areas. The Building Regulations for England and Wales recommend that acoustic conditions in schools comply with limits given in Building Bulletin 93. Performance targets for airborne sound, impact sound and reverberation of sound are set. There is also a requirement for a minimum Speech Transmission Index. On-site acoustic testing is now a requirement on government funded educational building projects to ensure the required acoustic performance is achieved. Detailed guidance on the principles of acoustic detailing of steel structures can be found in SCI P372. The Department of Education and Skills ‘Music accommodation in secondary schools: A design guide’ was published in 2010. Regulatory Reform (Fire Services) Order 2005. Building Regulations set school standards for heating, ventilation, lighting and acoustics and for the conservation of fuel and power. The Workplace (Health, Safety and Welfare) Regulations also require schools to be lit, heated and ventilated, cleaned and maintained to a reasonable standard. Adequate fire precautions should be implemented in schools to allow the safe escape of all occupants in case of fire. The Equalities Act 2010 brings all schools under obligation to prepare an accessibility strategy to improve the environment of the school for pupils with disabilities and special educational needs. Consideration should be given to particular health and safety needs of those pupils on the school premises and the means of addressing those needs. Robust material and structural performance. Procurement and lead-in time for specialist components, services, etc. Minimising site impacts, noise and disturbance, including deliveries, number of site personnel, etc. Optimising use of cranes for heavy lifting, including timing their use over weekends, school holidays, etc. Use of off-site applied intumescent coatings for fire protection. Minimising on-site waste and hence waste disposal. Connections in steel framed buildings in the educational sector reflect the functional nature of the space. For one and two storey buildings, the beam to column connections are often designed as moment resisting, which eliminates the need for vertical bracing that would otherwise interfere with the use of the space. Vertical bracing is generally needed for stability of buildings of three or more storeys or in tall gymnasia or halls, and this is usually in the form of X-braced cross-flats that are contained within the brickwork cavity. In this case, connections are designed as pinned. 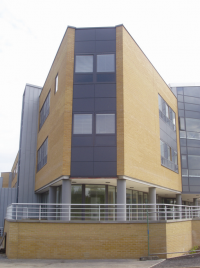 In the educational sector, the facade systems that are used must be robust to impact, and so brickwork is preferred at least for the ground floor. Brickwork can be attached to the light steel infill walls. At upper levels, lightweight cladding can be used, which is often in the form of wood boarding and insulated render that can be attached through insulation to the light steel walls. Other innovative uses of cladding materials include glued brick panels. Glazing for façades and skylights. Standards for School Premises - Consultation Document, Department for Education, November 2011. Metric Handbook - planning and design data. 3rd edition. Part 21 – Schools, Thompson, A. and Wadsworth, A. , Architectural Press, 2007. Key Design Guidance for Schools: access to information for school design, Schools Building and Design Unit, DfES August 2004.